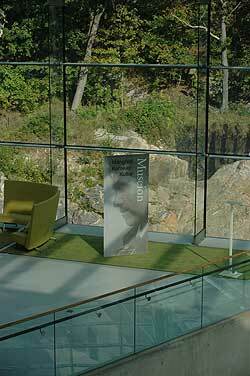 Museion is a Göteborg University program, co-operating with several University departments and the new Museum of World Culture (Världskulturmuseet). It was started with the view to integrate research with education and public presentations. It has a global and interdisciplinary focus. Since 8 August 2005 Museion is located within the premises of the new built Museum of World Culture, with which Museion is closely connected. In close collaboration with the Museum of World Culture Museion runs a two year (80 credit points) Masters programme in International Museum Studies. Of the thirty study places in the programme, fifteen are reserved for students from abroad. This international education is aimed at students from all over the world who wish to pursue a career in the museum sector. The programme is a post-graduate training of 😯 credit units (two academic years), which combines theory and practice through taught courses, qualified work experience in the museum sector and the writing of a Master´s dissertation. The students are required to have (or to obtain) a Bachelors Degree and are admitted to the programme as a whole. After successful completion students are awarded a Master’s Degree in International Museum Studies. The programme runs every other year. A new course started in the Fall 2008. More information on the Master’s programme. Under the theme ”Power and Marginalisation” (Makt och marginalisering), Museion ran a number of courses during the Spring 2008. Contact Person: Dr. Stellan Vinthagen, from the Dept. of Peace and Development Studies (PADRIGU), School of Global Studies, Göteborg University. ‡ A 15 credits course on Social and Legal Movements (Sociala och rättsliga rörelser). ‡ A 15 credits course on Power, Resistance and Change 1 (Makt, motstånd och förändring I). More information about the course. ‡ A 15 credits course on Power, Resistance and Change 2 (Makt, motstånd och förändring II). More information about the course. Under the theme ”Knowledge and Communication”, the following South Asia related courses were run during the Fall 2008. Last date for applications: Friday 18 April 2008. ‡ A 15 credits course China and India: Visualisations of Nations(Kina och Indien: visualiseringar av nationer). Contact person: Dr. Eva Rosén Hockersmit. Under the theme ”Power and Marginalization”, the following South Asia related course was run during the Fall 2008. Last date for applications: Friday 18 April 2008. ‡ A 15 credits course on The Challenges of Buddhism: Power, Morality and Resistance in a Global Perspective(Buddhismens utmaningar: makt, moral och motstånd i ett globalt perspektiv). Contact person: Dr. Per Lundberg, School of Global Studies, Göteborg University. More information about the course. Under the theme ”Globalisation”, the following South Asia related courses were run during the Fall 2008. Last date for applications: Friday 18 April 2008. ‡ A 15 credits course on Religion and Politics: Meetings in the Global Room (Religion och Politik: Möten i det globala rummet). Contact person: Jan Johansson from the Dept of Social Anthropology, School of Global Studies, Göteborg University. More information about the course. ‡ A 15 credits course on The Global City (Den globala staden). Contact person: Dr. Marie Thynell from the Dept. of Peace and Development Studies (PADRIGU), School of Global Studies, Göteborg University. More information about the course. ‡ A 15 credits course on Global Gender Studies (Globala Genusstudier). Contact person: Dr. Gunilla Blomqvistfrom the Dept. of Peace and Development Studies (PADRIGU), School of Global Studies, Göteborg University. More information about the course. During the Spring 2009, Museion also offers another South Asia related course under the theme ”Power and Marginalisation”. ‡ A 15 credits course on Power, Resistance and Change 1 (Makt, motstånd och förändring I). Contact person: Dr. Stellan Vinthagen, from the Dept. of Peace and Development Studies (PADRIGU), School of Global Studies, Göteborg University. More information about the course. In the Fall 2007, Museion at Göteborg University also arranged a 15 credits course titled Tales of Objects: between traditions and modernities in India and China (Föremålen berättar: mellan traditioner och moderniteter i Indien och Kina). The course aimed at providing tools for understanding visual culture and its role. The work material consisted of objects from the collections of the Museum of World Culture, combined with modern ethnographic material, through which aspects of ancient and contemporary Indian and Chinese culture and society was studied. The course was led by the Sinologist Marie Carlsson and Dr. Eva Rosén-Hockersmith from the Dept. of Religous Studies and Theology, Göteborg University. Museion conducts research in close collaboratioin with the Museum of World Culture and its exhibitions. Anthologies have for example been published as part of the exhibitions ”Horizons – perspecitves on a global Africa” and ”No name fever – AIDS in the age of globalization”. In connection with an exhibition on trafficking, Museion researchers have studied trade with archeological objects as well as the debate on trafficking in Sweden. From autumn 2005 Peter Davis is a guest professor at Museion. He holds a professorship in museology at Newcastle University, UK, where he also was director of the School of Arts and Cultures until 2005. His main task at Museion will be to form a new research profile for the department. The archeologist Eva Myrdal was connected to Museion until 2002. She has been involved in research on South Asia, especially in Sri Lanka, for many years. The research includes a project called ”Comparative studies of production processes in certain marginal areas in South Asia and North Europe”, where she compared research data on the use and control of forest resources in the Swedish province of Värmland, and the dry areas of Sri Lanka. The project has included research collaboration with the Postgraduate Institute of Archaeology at Kelaniya University in Sri Lanka. On the Research Conference ”Structures of Vulnerability” held at Stockholm University 12–14 January 2005 Eva Myrdal chaired a panel on ”Cultural Heritage and Sustainability in long-term Perspective”, where she also presented her own research paper on ”The Archaeology of Colonial Warfare. Changing Land-use Patterns in Sri Lanka in its 19th century”. In 2001 Myrdal along with Jan af Geijerstam, Dept of History of Science and Technology, Royal Institute of Technology, Stockholm, was given a planning grant by SASNET for a project called ”Exploring the state of art of studies of the South Asian societal/nature interface through time”. The suggestion involved networking in order to arrange a symposium with the view of bridging the gap between the humanities, the social sciences, the natural sciences and technology. It was first presented by Myrdal and af Geijerstam at the SASNET virtual conference in December 2000. Read the suggestion. The project involved networking in order to arrange a symposium with the view of bridging the gap between the humanities, the social sciences, the natural sciences and technology. The presentations would be supposed to include studies of ”high tech” history as well as of regional traditional rural or tribal techniques of everyday life and modern studies of technology transfer and appropriate technology. Eva Myrdal was responsible for the Swedish and Sri Lankan contacts, and she arranged a networking meeting in Göteborg on 19 April 2002. Contacts were established with educational and research institutions in Sweden, India and Sri Lanka, representing the humanities, social sciences, the applied natural sciences and public institutions responsible for dissemination to the general public (museums). Since 2003 Eva Myrdal is Head of Unit Research and Development at the s at Skeppsholmen in Stockholm. This is the museum in Sweden which has the main responsibility of presenting Asia to the Swedish public (apart from the Near East). It manages archaeological collections from China, South-East, Central and South Asia. Apart from this one major focus of the collection is on Buddhist East and South East Asia but it also contains Buddhist and Hindu sculptures and bronzes from India, as well as a small collection of Mughal paintings. Eva Myrdal and the museum director Magnus Fiskesjö have been engaged in making a collection of 1 500 years old artefacts from the settlement site Rang Mahal in Rajasthan, India, available to the public. The artefacts were found by an Indo-Swedish archeological team headed by Hanna Rydh in the 1950’s, but has so far not been exposed. In October 2003 Myrdal and Fiskesjö published an article on this in SYDASIEN 3/03. Go for the article ”Impressive finds from ancient rice farmers” (in Swedish only).